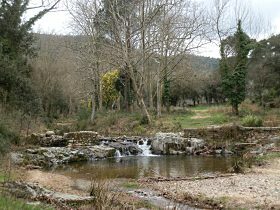 The road from Calonge up to Romanya de la Selva follows a small stream up the valley. 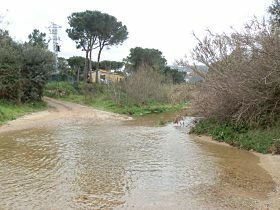 Along this stream is a path known as the Cami de Molins which runs at the bottom of the Cabanyes urbanisation just outside Calonge. This estate seems to fill the whole hillside as you drive past on the dual carriageway and isn't immediately that inspiring as somewhere to walk. 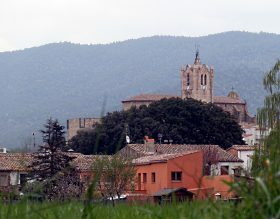 In fact, the urbanisation is both mature and well maintained and sensibly spaced out, though it still suffers as most urbanisations in Spain do, from being too separate from the main old historic centre of Calonge. 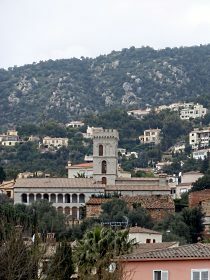 The buidling of estates in isolation, means they have relatively few facilities such as shops or bars, while the old town centres fell into a little bit of decay as the population moved out into the newer more luxurious houses in the surrounding estates, but then have to rely on driving to reach even the most basic amenities. The walk though, mostly passes along the fringes of the estate running along the stream and then into the Gavarres and over the top, only coming through the estate for the last part of the loop. We parked on one of the estate roads and walked along the main Romanya road (not much walking space) to a clearly marked footpath junction (we're following yellow-white flashes). The path was more of a gravel road and passed through a ford. Unfortunately we've had some rain recently and the ford lacked stepping stones - so crossing meant taking shoes and socks off and walking through. We then walk along the stream past houses and a few tarmac roads before the path turns into a proper track only suitable for walking. We're at the start of spring and we saw the occasional asparagus hunter in among the trees by the stream. The first leaves were budding on the trees and meadow flowers were coming out. As the path runs beyond the final houses of the estates it runs past a series of brick wiers with water gushing over into mill ponds. The path runs up and over the valley of a tributary before rejoining the main stream passing through fields and then an old mill. From the old mill it turns up to the main Romanya road and we cross the road and start upwards into the hills. It's a typical Gavarres gravel road with deep water tracks gouged out of the surface making them only really suitable for high-mounted 4x4s. We walk past a couples of renovated masias and an old farm with peacocks sharing a paddock with donkeys. At a junction at the top we follow the signs towards Calonge. We keep going up, but finally reach a flattish path across the top. The trees are too high to give us any views, but there is a viewpoint marked and we scramble onto the top of some flat rocks to look out over the valley below and parts of Romanya in the distance. The path continues and we come to a block in the path - a chain across the direction we should go. This isn't that common particularly on officially marked paths, but it does happen - there are infamous cases of foreign buyers putting up fences to walkers, in one particular case on the GR92 leading to local officials cutting the fence and leaving notices. So we double check both on the map and for the yellow and white flashes. Despite the barrier, the path does go on. It takes us along past some vineyards then along past an old masia on top with fabulous views out towards Palamos across Calonge. The path becomes the masia's drive and we continue out and down the hill. A big gate is in front of us, but space has been left to let us past. As if to double confirm it is the right route, the yellow-white flash has been painted right next to the gate and 50m further down the road is another official waymarker sign. 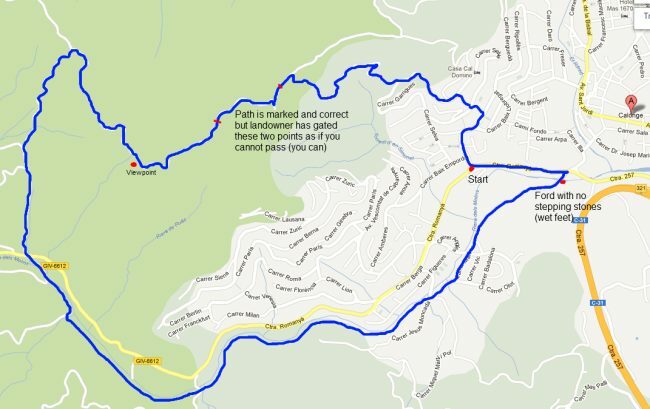 We now continue down the hill all the way until it reaches the first tarmacked roads of the estates then navigate through the estate finding a series of stairways down through the zig-zagging roads.